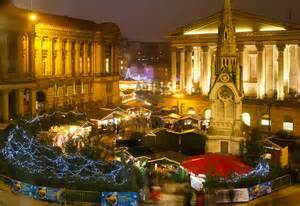 Birmingham hosts the biggest German Christmas market held outside of Germany and Austria. There's a huge range of comforting Teutonic food, from mulled wine and preztels to bratwust and knoblauchbrot (German garlic bread). You're unlikely to leave hungry. One of the best-located Christmas markets stretches along the Southbank in London, where you can wander down the riverside while sipping a steaming beverage (perhaps from the Cider Lodge) and nibbling a mince pie. The hot chocolate from Jaz & Jul's is particuarly good (we strongly suggest you try the chilli version). 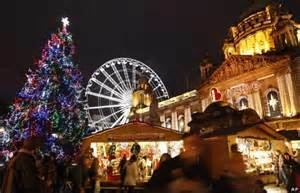 You could spend all day tucking into the goodies at Belfast's European-inspired extravaganza at St George's Market. Delicacies on offer include traditional Spanish paella, proper French crepes, Dutch pofitjes (mini-pancakes), and exotic meats from around the world. Roast kangaroo with Brussels sprouts, anyone? 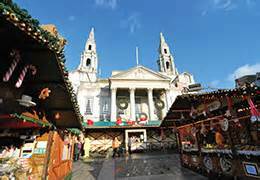 This German Christmas Market, set in the heart of Leeds at Millennium Square, is a great place to stock up on stollen and schnitzels. if it's rainy outside, you can even huddle away in the cosy Alp Chalet Bavarian eatery. 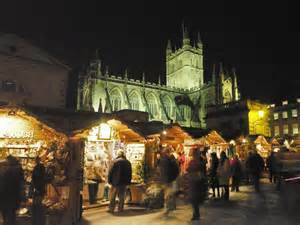 Set against the backdrop of the beautiful Abbey, Bath Christmas Market draws crowds of people from the south-west and beyond every year. It's primarily a crafts-and-gifts market, but there's plenty of nibbles to be enjoyed. You can pick up slow-roasted beef from the Thoroughly Wild Meat Co, homemade fudge from Bath's Fudge Kitchen, or even a jar of pickled eggs with beetroot or garlic from the Purely Pickled Eggs stall. Held over four days this year, Lincoln offers 200 stalls selling a range of craft and food products around the city's magnificent cathedral and castle. Churros, local meats, homemade curries and cupcakes are all promised. If you're not too full to squeeze into a pew, don't miss the carol service in the cathedral on the evening of 4 December. 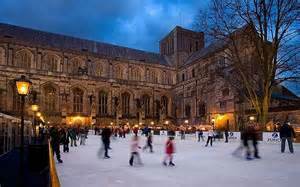 More than 350,000 visitors a year flock to Winchester's Christmas market - join them in the Cathedral’s historic Close (and lace up your ice skates for the outdoor rink). Exhibitors this year include homemade preserves from The Cherry Tree, cheese from Neal's Yard Dairy (if they've got their creamy blue Stichelton, do try it), and handmade wooden chopping boards from BoardnBread. 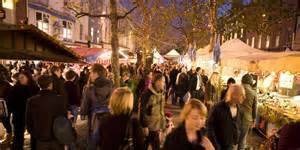 There are various fairs and markets taking place as part of York's annual Christmas festival. Grab some roasted chesnuts at the Dickensian-themed St Nicholas Fair on Parliament Street, then head to the Medieval Market at Barley Hall to try a pint of traditional ale at the 'Medieval bar'. There are great foodie events going on all over the city, too, including chocolate-making workshops at York Cocoa House.